This Clinical Guidance is aimed at Physiotherapists, Strength & Conditioning Coaches and Doctors to prevent and manage ACL ruptures during professional downhill, freestyle skiing and ski-cross during off-season. A search was performed on Cochrane Collaboration, the York Centre for Reviews and Dissemination, and the United States Agency for Health Care Policy and Research. These systematic reviews provided guidelines to create this evidence based tool. The level of evidence is graded according to criteria described by the Centre of Evidence Based Medicine Oxford United (CEBM) (http://www.cebm.net/). See Figure 1. Evidence strength was rated according to Guyatt et al. (1995). No decline in ACL injuries and re-injury rates in professional alpine skiers is reported (Pujol, 2007). 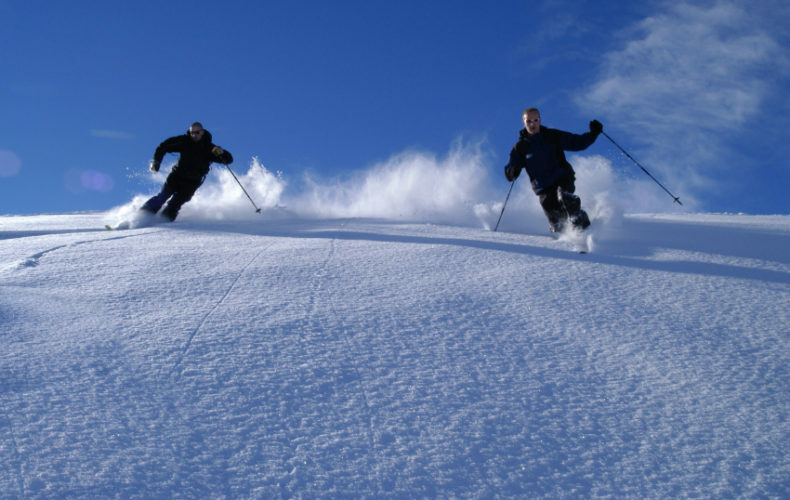 This statistics shows primary ACL injury rate at 5.7 per 100 skier-seasons with a 19% re-injury rate and a bilateral ACL injury incidence of 30.5%. During professional skiing, these injuries affect both sexes equally (Pujol, 2007; Westin et al., 2012). In contrast, more female recreational skiers sustain ACL injuries (Flørenes et al., 2009). Professional skiers endure deceleration from high speeds, jumping, cutting and pivoting, placing stress on the knees resulting in non-contact ACL injuries (Griffin et al., 2006). Injuries occur during hard landings when rigid ski boots induce tibial anterior drawer injuries (Natri et al., 1999; Flørenes, 2009), while the athletes assume seated posture and quadriceps contracts maximally (Johnson 1995). Bere et al., (2014) described the “slip-catch” mechanism: the skier loses balance backwards or inwards during turning. The inside edge of the outer ski catches the snow causing forced valgus and tibial internal rotation position. Cochrane reported inconclusive evidence of ACL injury management (Linko et al., 2005). Using a pre-screening criteria can determine the ‘copers’ or ‘non-copers’, indicating who will return to sport (RTS) without surgery (Fitzgerald et al., 2000; Hurd et al., 2008; Logerstedt et al., 2010a). These potential ‘copers’ can be conservatively managed by perturbation neuromuscular training (NMT) (Fitzgerald, 2000). However, this will be a minority of skiers that may be considered for short term conservative management to complete a season (Fitzgerald, 2000). Anterior Cruciate Ligament Reconstruction (ACLR) is indicated for active adolescents with a good prognosis of 85% to RTS. It is unlikely for active adolescents to return to the same sporting level with conservative management only (Ramski et al., 2013). ACLR is cost-effective, at $38,121 per repair in comparison to rehabilitation alone that may include knee instability risk at $88,538. (Lubowitz et al., 2011; Mather et al., 2013). Surgical management is indicated for active adolescents wanting to return to high level sport. ACLR is more cost-effective than rehabilitation only. Optimal surgical timing is controversial. Ideally the outcome must be optimised with minimal post-operative complications. A systematic review demonstrated surgery may be performed from 2 days post-trauma (Andernord et al., 2013). Another review found that ACLR can be performed from one week post-injury together with a moderately accelerated programme with a low post-operative stiffness risk (Kwok et al., 2013). Rapid surgical intervention after an acute ACL rupture may cause arthrofibrosis (Cosgarea et al., 1995; Mauro et al., 2008). Delaying surgery for high-level athletes, or athletes with increased knee instability post-injury, may cause secondary meniscal injuries and degenerative Osteoarthritis (OA) (Beynnon et al., 2005; Amin et al., 2008; Ajuied et al., 2013). Post-surgical complications include deep vein thrombosis (Ramos et al., 2008) and septic arthritis (Van Tongel et al., 2007). Surgery should not be performed too soon due to arthrofibrosis risk but a lengthy delay may cause OA or meniscal injuries. Prehabilitation aims to enhance postoperative outcome. Aims and criteria for progression to surgery include: Minimal knee swelling, full range of motion (ROM) including knee extension, normal gait and Quadriceps strength (Ditmeyer et al., 2002). A pre-operative 6-week home-based and gym programme consisting of NMT and strengthening programme resulted in enhanced postoperative outcomes. Pre-operative improvements (hop tests and quadriceps hypertrophy) were evident. These enhancements were still present 12-weeks post-operative (Shaarani et al., 2013). A prehabilitation programme will enhance the post-operative outcome up to 12 weeks. The ACL consists of 2 distinct bundles. The ACLR is performed by drilling either a single or double tunnel through the tibia and femur, to pass the graft through. Cochrane reported no difference in outcome scores when performing SB compared to DB ACLR (Tiamklang et al., 2012; Bjornsson et al., 2013; Xu et al., 2013). A meta-analysis showed DB as the superior technique since it provides better rotational stability. This may not affect the functional outcome compared to SB (Li et al., 2014). DB may reduce re-rupture rates but is more invasive and technically demanding (Tiamklang, 2012). In the short term, DB is cost-effective due to low revision rates. However, long term follow-up is indicated (Paxton et al., 2010). Effective DB technique improves rotational stability, less re-rupture rates and has short term cost-effectiveness, compared to SB technique. Cochrane reviews demonstrate no significant difference of knee stability is achieved when using either Hamstring (HT) or Patella tendon (BPTB) graft techniques (Liden et al., 2007; Maletis et al., 2007; Magnussen et al., 2011; Mohtadi et al., 2011). After discussion with the patient, the surgeon will choose the suitable graft. Consideration should be: type of sport, age, accelerated rehabilitation and RTS (Magnussen, et al., 2010; Rahr-Wagner, et al., 2014). The more frequently the surgeon performs ACLR the better the outcome. Surgeons with a lower volume ACLR (52 ACLR in 12 months) (Lyman et al., 2009). Hospitals hosting two or fewer ACLR monthly are 32% more likely to have a 90-day post-operative readmission, in contrast to hospitals performing more than 10 ACLR monthly (Lyman, 2009). ACLR using HT and BPTB showed identical knee stability outcomes. Surgical suspension fixation is used. This may increase longitudinal movement between fixation point and graft resulting in bone tunnel enlargement, compromising knee stability (Webster et al., 2001). Reduces knee flexion and internal rotation strength. Takes longer to heal (9-12 weeks)(Weiler et al., 2002) causing later RTS. Additional infection risk (Maletis et al., 2013b). A screw-in fixation is used (Anderson et al., 2001). Complications: anterior knee pain, patella fractures, inability to kneel. Heals faster (6 weeks) than HT (Papageorgiou et al., 2001) and quicker RTS (Weiler et al., 2002). Used in younger age group (<20 years) when accelerated rehabilitation is required (Magnussen et al., 2010). Causes less OA due to increased stability ((Li et al., 2012; Rahr-Wagner, 2014). ACLR performed with fresh frozen allograft that has not been chemically treated or irradiated, produced equivalent clinical outcome compared to autografts (Lamblin et al., 2013). LARS is a polyester graft that compares well to BPTB. It may be used in athletes performing high demanding sport with a 6-months RTS (Pan et al., 2013). It may cause post-operative synovitis (Klein et al., 1992). Uncertainty exists over long term OA risk (Pichon et al., 2007). Autografts and untreated fresh frozen allografts produce similar clinical outcome. Standardised functional outcome measures determine rehabilitation progression and RTS. The single-limb hop tests measure neuromuscular ability and dynamic knee stability, and demonstrates good test-retest reliability (ICC) in normal young subjects (Noyes et al., 1991; Ross et al., 2002). During ACL rehabilitation the hop tests measured with good reliability and validity (7.05% – 12.96%) (Reid et al., 2007). Various patient-assessed health instruments with varying validity, measures patients’ perception of the ACLR outcome. The Knee Injury and Osteoarthritis Outcome Score(KOOS) measures symptoms and disability with responsiveness values (MDC95) to change: pain, symptoms, daily living activities, sport and recreational and knee specific quality of life, but lacked addressing mental health domains(Garratt et al., 2004; Wright, 2009; Logerstedt et al., 2010a). International Knee Documentation Committee 2000 form(IKDC) is a joint-specific outcome that measures symptoms, function, and sports activity aimed at various knee ailments with good test-retest value especially in bigger groups (Collins et al., 2011; Logerstedt 2010a). However, Irrgang et al. (2006), demonstrated that due to higher MDC95- values, responsiveness may be compromised. The Knee Outcome Survey-Activities of Daily Living Scale(KOS-ALDS) is responsive to knee functional assessment with good test-retest (ICC 0.97) and minimal detectable changed values for MDC95 (Irrgang et al., 1998). KOOS, IKDC or KOS-ALDS, and Hop tests may be used to assess pain, disability, function and clinical presentation changes during rehabilitation. Effective communication between the patient and the MDT will optimise rehabilitation and outcome to RTS. Cryotherapy is used for post-operative pain and swelling reduction and to promote knee ROM and drainage. Evidence confirmed the cryotherapeutic analgesic effect, however no change was shown for ROM or drainage (Raynor et al., 2005). It is recommended that cryotherapy is used for pain relief immediate post-operative and ongoing during the first weeks of rehabilitation. Eccentric, concentric and NMT is used during rehabilitation to improve quadriceps contractions. Eccentric rehabilitation is effective to improve quadriceps strength. NMT improves motor learning in addition to strength training. Eccentric training improves quadriceps strength better than concentric exercises (Gokeler et al., 2013). Rehabilitation should be a combination of concentric, eccentric, and NMT. Shelbourne & Nitz (1990), described accelerated rehabilitation by initially aiming to restore full weight bearing, knee extension and optimising quadriceps activity. According to a study, 85% of participant with BPTB accelerated group (19-weeks) and non-accelerated BPTB group (32-weeks), showed almost equivalent anterior posterior laxity (1.3mm difference) after the first 3-months, postoperative. After the two year follow-up the outcome were again similar for both groups (Beynnon et al., 2011). 19-week accelerated rehabilitation is possible when using BPTB ACLR. OKC is performed while the foot is not planted, by performing leg extensor resistance training using ankle weights. OKC increases anterior tibial translation (Beynnon et al., 1997), which may result in increased graft stress causing knee laxity. However, OKC may increase quadriceps torque, resulting in accelerated rehabilitation and RTS. During CKC the foot is supported by using a leg-press machine (Andersson et al., 2009). CKC promotes joint compression and knee stability (Beynnon et al., 1997). Uncertainty exists in the quantity of quadriceps loading that can safely be applied to gain quadriceps strength improvements in HT graft rehabilitation. During the initial HT post-surgical phase, graft necrosis takes place causing optimum graft weakness at 6-8 weeks (Scheffler et al., 2008). HT graft stress would cause more instability and needs to be protected. OKC for HT graft, from 90-45° knee flexion can be safely performed from 4-weeks post-operatively without stressing the HT graft, resulting in improved quadriceps strength (Fukuda et al., 2013). Further studies should assess the frequency and magnitude of quadriceps activation allowed. OKC exercises to strengthen quadriceps are allowed for HT at 4-weeks but is limited to 90-45° as it places stress on the graft, while CKC places less stress on the graft. NMT is the facilitation of movement training progressions from single plane low intensity training to multi-planar complex power training, resulting in improved joint kinaesthesia, stability, acceleration and deceleration (Hewett et al., 2002). In addition, NMT reduces ACL re-injury (Johansson et al., 1991) and includes balance, proprioception and plyometrics. A combination of NMT and strengthening produce better outcomes than only strength training exercises after 6 months (Risberg et al., 2007) and also confirmed during 2 and 4 year follow-ups (Risberg & Holm 2009). NMT improved global knee function and pain relief, while strengthening improved hamstring strength after two years post-operative. Rehabilitation should combine NMT and strength training to increase knee stability and movement coordination during supervised physiotherapy. Postoperative quadriceps inhibition is caused by arthrogenic muscle inhibition (Palmieri et al., 2004). Combining NMES and quadriceps exercises improves quadriceps contraction during the first 4 weeks post-operative (Kim et al., 2010). NMES is not a substitute for muscle volitional exercises (Bax et al., 2005), but will promote quadriceps contraction initially. NMES compared to a standard post-operative strength programme improved the quadriceps strength of the NMES group by an average of 29% after 6-month follow-up (Feil et al., 2011). Inconclusive evidence exists to show whether NMES has any effect on functional performance or patient-orientated outcomes. NMES may contribute to quadriceps contraction in the first weeks postoperatively, but patient-orientated outcomes may not be influenced. Post-surgical bracing (0-6 weeks) has no beneficial influence on ACLR outcome, pain or knee stability (Wright et al., 2008a, Andersson et al., 2009). No evidence was found that functional bracing reduces re-injury in 100 patients during land-based exercise (McDevitt et al., 2004). However, functional knee bracing may enhance the proprioceptive input during downhill ski (Nemeth et al., 1997). Functional bracing showed reduced ACL re-injury during 6 seasons. The non-braced skiers were 3.9 times more likely to re-injure than the braced skiers (Sterett et al., 2006). Post-operative bracing has no role in ACLR. Functional bracing may be effective in downhill skiing. The quality and cost of rehabilitation protocols are influenced by home-based versus supervised rehabilitation. Evidence showed no difference between home- and clinic-based groups assessed by knee ROM, laxity, strength and function (six months to one year) (Andersson et al., 2009). A combined supervised- and home-programme will be more beneficial and cost effective during rehabilitation. Avoidance of knee compression, hip abduction torque and tibial internal rotation is essential for ski prevention programmes. By strengthening the hip abductor, extensor and hamstrings may contribute to protecting the knee against forces (Bere et al., 2014). Injuries may be reduced by NMT, educational tools and interventions (Gagnier et al., 2013). Awareness videos and training programmes reduce injuries in professional skiers (Ettlinger et al., 1995). These videos prevented injuries by teaching skiers to identify and respond correctly when at risk of sustaining injury. NMT should be implemented during the training of young female adolescents. This will counteract the neuromuscular deficiencies that develop at a later adolescent developmental phase, resulting in altered mechanics and injuries (Myer et al., 2013). Injury prevention is effective (Walden et al., 2012). Injury reduction of 64% was achieved (N=4564, between ages of 12-17). Injuries occurred at -0.07 (95% CI -0.13 to 0.001) per 1,000 playing hours in favour of the preventative group (Walden, 2012). A preventative programme must be encouraged by all MDT members. The programme must have a duration of 10 to 20 minutes, thrice weekly during pre-season and once weekly during season (Grindstaff et al., 2006). Inconclusive evidence for the effectiveness and type of male injury prevention programmes exist (Alentorn-Geli et al., 2014). Numbers-needed-to-treat is between 108-120 training players to prevent one ACL injury (Sugimoto et al., 2012a). Further research to improve the screening process together with sport specific prophylactic programmes are required. The correct ski binding should be used for the level of skier and be adjusted properly to reduce ACL injuries (Young et al., 1976). Effective prevention programmes need to be sport specific. Preventative videos are effective to educate skiers. Ajuied, A., Wong, F., Smith, C., Norris, M., Earnshaw, P., Back, D., & Davies, A. (2013). Anterior cruciate ligament injury and radiologic progression of knee osteoarthritis: a systematic review and meta-analysis. American Journal of Sports Medicine, DOI: 10.1177/0363546513508376. Alentorn-Geli, E., Mendiguchia, J., Samuelsson, K., Musahl, V., Karlsson, J., Cugat, R., & Myer, G.D. (2013). Prevention of non-contact anterior cruciate ligament injuries in sports. Part II: systematic review of the effectiveness of prevention programmes in male athletes. Knee Surgery, Sports Traumatology, Arthroscopy, 22(1): 16-25. DOI: 10.1007/s00167-013-2739-x. Amin, S., Guermazi, A., Lavalley, M.P., Niu, J., Clancy, M., Hunter, D.J., Grigoryan, M., & Felson, D.T. (2008). Complete anterior cruciate ligament tear and the risk for cartilage loss and progression of symptoms in men and women with knee osteoarthritis. Osteoarthritis Cartilage, 16(8): 897-902. Andersson, D., Samuelsson, K., & Karlsson, J. (2009). Treatment of anterior cruciate ligament injuries with special reference to surgical technique and rehabilitation: an assessment of randomized controlled trials. Arthroscopy, 25(6): 653–685. Anderson, A.F., Snyder, R.B., Lipscomb, A.B. (2001). Anterior cruciate ligament reconstruction. A prospective randomised study of three surgical methods. American journal of Sports Medicine, 29(3): 272-279. Bax, L., Staes, F., & Verhagen, A. (2005). Does neuromuscular electrical stimulation strengthen the quadriceps femoris? A systematic review of randomised controlled trials. Sports Medicine, 35(3): 191-212. Beynnon, B.D., Johnson, R.J., Fleming, B.C., Stankewich, C.J., Renstrom, P.A., & Nichols, C.E. (1997). The strain behaviour of anterior cruciate ligament during squatting and active flexion-extension: a comparison of an open and closed kinetic chain exercise. American Journal of Sports Medicine, 25(6): 823-829. Cosgarea, A.J., Sebastianielli, W.J., & DeHaven, K.E. (1995). Prevention of arthrofibrosis after ACL reconstruction using central third patellar tendon autograft. The American Journal of Sports Medicine, 23(1): 87-92. Ditmeyer, M.M., Topp, R., & Pifer, M. (2002). Prehabilitation in preparation of orthopaedic surgery. Orthopaedic Nursing, 21(5): 43-51. Ettlinger, C., Johnson, R., & Shealy J. (1995). A Method to help reduce the risk of serious knee sprains incurred in alpine skiing. The American Journal of Sports Medicine, 23(5): 531-537. Fitzgerald, G.K., Axe, M.J., & Snyder-Mackle, L. (2000). The efficacy of perturbation training in nonoperative anterior cruciate ligament rehabilitation programs for physically active individuals. Physical Therapy, 80(2): 128-140. Fujimoto, E., Sumen, Y., Urabe, Y., Deie, M., Murakami, Y., Adachi N, & Ochi, M. (2004). An early return to vigorous activity may destabilize anterior cruciate ligaments reconstructed with hamstring grafts. Archives of Physical Medicine and Rehabilitation, 85(2): 298–302. DOI: 10.1016/S0003-9993(03)00621-X. Fukuda, T.Y., Fingerhut, D., Moreira, V.C., Camarini, P.M.F., Scodeller, N.F., Duarte, A., Martinelli, M., Bryk, F.F. (2013). Open kinetic chain exercises in a restricted range of motion after anterior cruciate ligament reconstruction: a randomized controlled clinical trial. The American Journal of Sports Medicine, 41(4): 788-794. Grindstaff, T.L., Hammill, R.R., Tuzson, A.E., & Hertel, J. (2006). Neuromuscular control training programs and noncontact anterior cruciate ligament injury rates in female athletes: a numbers-needed-to-treat analysis. Journal of Athletic Training, 41(4): 450-456. Guyatt, G.H., Sackett, D.L., Sinclair, J.C., Hayward, R., Cook, D.J., & Cook, R.J. (1995). Users’ guides to the medical literature IX. A method for grading health care recommendations. Evidence-Based Medicine Working Group. Journal of the American Medical Association, 274(22): 1800-1804. Hewett, T.E., Paterno, M.V., & Myer, G.D. (2002). Strategies for enhancing proprioception and neuromuscular control of the knee. Clinical Orthopaedics and Related Research, 402, 76-94. Irrgang, J.J., Snyder-Mackler, L., Wainner, R.S., Fu, F.H., & Harner, C.D. (1998). Development of a patient-reported measure of function of the knee. Journal of Bone and Joint Surgery [American Volume], 80(8): 1132–1145. Johansson, H., Sjolander, P., & Sojka, P. (1991). A sensory role for the cruciate ligaments. Clinical Orthopaedics & Related Research, 268, 161-178. Johnson, S.C. (1995). Anterior cruciate ligament injury in elite Alpine competitors. Medicine and Science in Sports and Exercise, 27(3): 323–327. Klein, W., & Jensen, K.U. (1992). Synovites and artificial ligaments. Arthroscopy, 8(1): 116-124. Lysholm, J., & Gillquist, J. (1982). Evaluation of the knee ligament surgery results with special emphasis on use of a scoring scale. The American Journal of Sports Medicine, 10(3): 150-154. MacDonald, P.B., Hedden, D., Pacin, O., & Huebert, D. (1995). Effects of an accelerated rehabilitation program after anterior cruciate ligament reconstruction with combined semitendinosus-gracilis autograft and a ligament augmentation device. The American Journal of Sports Medicine, 23(5): 588–592. DOI: 10.1177/036354659502300512. Maletis, G.B., Cameron, S.L., Tengan, J.J., & Burchette, R.J. (2007). A prospective randomized study of anterior cruciate ligament reconstruction: a comparison of patellar tendon and quadruple-strand semitendinosus/gracilis tendons fixed with bioabsorbable interference screws. The American Journal of Sports Medicine, 35(3): 384-394. McDevitt, E.R., Taylor, D.C., Miller, M.D., Gerber, J.P., Ziemke, G., Hinkin, D., Uhorchak, J.M., Arciero, R.A., & Pierre, P.S. (2004). Functional bracing after anterior cruciate ligament reconstruction: a prospective, randomized, multicenter study. The American Journal of Sports Medicine, 32(8): 1887-1892. Mulford, J.S., & Chen, D. (2011). Anterior cruciate ligament reconstruction: A systematic review of polyethylene terephthalate grafts. ANZ Journal of Surgery, 81(11): 785-789. Natri, A., Beynnon, B.D., Ettlinger, C.F., Johnson, R.J., & Shealy, J.E. (1999). Alpine ski bindings and injuries. Current findings. Sports Medicine (Auckland, N.Z. ), 28(1): 35-48. Nemeth, G., Lamontagne, M., Tho, K., Eriksson, E. (1997). Electromyographic activity in expert downhill skiers using functional knee braces after anterior cruciate ligament injuries. The American Journal of Sports Medicine, 25(5): 635-664. Noyes, F.R., Barber, S.D., & Mangine, R.E. (1991). Abnormal lower limb symmetry determined by function hop tests after anterior cruciate ligament rupture. American Journal of Sports Medicine, 19(5): 513–518. Pan, X., Wen, H., Wang, L., & Ge, T., (2013). Bone–patellar tendon–bone autograft versus LARS artiﬁcial ligament for anterior cruciate ligament reconstruction. European Journal of Orthopaedic Surgery and Traumatology, 23(7): 819-823. DOI: 10.1007/s00590-012-1073-1. Papageorgiou, C.D., Ma, C.B., Abramowitch, S.D., Clineff, T.D., & Woo, S.L. (2001). A multidisciplinary study of the healing of an intraarticular anterior cruciate ligament graft in a goat model. The American Journal of Sports Medicine, 29(5): 620-626. Palmieri, R.M., Tom, J.A., Edwards, J.E., Weltman, A., Saliba, E.N., Mistry, D.J., & Ingersoll, C.D. (2004) Arthrogenic muscle response induced by an experimental knee joint effusion is mediated by pre- and post-synaptic spinal mechanisms. Journal of Electromyography and Kinesiology, 14(6): 631–640. Persson, A., Fjeldsgaard, K., Gjertsen, J.E., Kjellsen, A.B., Engelbretsen, L., Hole, R.M., & Fevang, J.M. (2014). Increased Risk of revision with hamstring tendon grafts compared with patellar tendon grafts after anterior cruciate ligament reconstruction. American Journal of Sports Medicine, 42(2): 258-291. Pichon, R.A., Augustovski, F., Alcaraz, A., Bardach, A., Ferrante, D., Garcia, M.S., Glujovsky, D., Lopez, A., Regueiro, A. (2007). Usefulness of synthetic graft in knee anterior cruciate ligament reconstruction. Buenos Aires: Institute for Clinical Effectiveness and Health Policy (IECS). Informe de Respuesta Rapida, 91. Pujol, N., Blanchi, M.P., & Chambat, P. (2007). The incidence of anterior cruciate ligament injuries among competitive Alpine skiers: a 25-year investigation. The American Journal of Sports Medicine, 35(7): 1070-1074. Rahr-Wagner, L., Thillemann, T.M., & Pedersen, A.B. (2014). Comparison of Hamstring Tendon and Patellar Tendon Grafts in Anterior Cruciate Ligament Reconstruction in a Nationwide Population-Based Cohort Study: Results from the Danish Registry of Knee Ligament Reconstruction. American Journal of Sports Medicine, 42(2): 278-284. Raynor, M.C., Pietrobon, R., Guller, U., Higgins, L.D. (2005). Cryotherapy after ACL reconstruction: a meta-analysis. The Journal of Knee surgery, 18(2): 123-129. Roos, E.M., Roos, H.P., & Lohmander, L.S., (1998). Knee Injury and Osteoarthritis Score (KOOS)- development of a self-administrated outcome measurement. Journal of Orthopaedic Sports Physical Therapy. 28(2): 88-96. Roos, E.M., Bremander, A.B., Englund, M., & Lohmander, L.S. (2008). Changes in self-reported outcomes and objective physical functions over 7 years in middle-aged subjects with or at high risk of knee osteoarthritis. Annals of Rheumatic Diseases, 67(4): 505-510. Risberg, M.A., Holm, I, Myklebust, G., & Engebretsen, L. (2007). Neuromuscular training versus strength training during first 6 months after anterior cruciate ligament reconstruction: a randomized clinical trial. Physical Therapy, 87(6): 737-750. Ross, M.D., Langford, B., & Whelan, P.J. (2002). Test-retest reliability of 4 single-leg horizontal hop tests. Journal of Strength and Conditioning Research, 16(4): 617-622. Shelbourne, K.D., & Nitz, P. (1990). Accelerated rehabilitation after anterior cruciate ligament reconstruction. The American Journal of Sports Medicine, 18(3): 292-299. Sugimoto, D., Myer, G.D., Bush, H.M., Klugman, M.F., Medina McKeon, J.M., & Hewett, T.E. (2012b). Compliance with neuromuscular training and anterior cruciate ligament injury risk reduction in female athletes: a meta-analysis. Journal of Athletic Training, 47(6): 714-723. DOI: 10.4085/1062 6050-47.6.10. Tegner, Y., & Lysholm, J. (1985). Rating systems in the evaluation of knee ligament injuries. Clinical Orthopaedics and Related Research, 198, 43-49. Webster, K.E., Feller, J.A., & Hameister, K.A. (2001). Bone tunnel enlargement following anterior cruciate ligament reconstruction: a Randomised comparison of hamstring and patellar tendon grafts with 2 year follow-up. Knee Surgery, Sports Traumatology, Arthroscopy, 9(2): 86-91. Weiler, A., Hiffman, R.F.G., Rehm, O., & Südkamp, N.P. (2002). Tendon Healing in a bone tunnel part 11: Histologic analysis after biodegradable interference fit fixation in a model of anterior cruciate ligament reconstruction in sheep. Arthroscopy, 18(2): 124-135. Wright, R.W., Preston, E., Fleming, B.C., Amendola, A., Andrish, J.T., Bergfeld, J.A., Dunn, W.R., Kaeding, C., Kuhn, J.E., Marx, R.G., McCarty, E.C., Parker, R.C., Spindler, K.P., Wolcott, M., Wolf, B.R., Williams, G.N. (2008a). A systematic review of anterior cruciate ligament reconstruction rehabilitation: part I: continuous passive motion, early weight bearing, postoperative bracing, and homebased rehabilitation. The Journal of Knee Surgery, 21(3): 217-224. Wright, R.W., Preston, E., Fleming, B.C., Amendola, A., Andrish, J.T., Bergfeld, J.A., Dunn, W.R., Kaeding, C., Kuhn, J.E., Marx, R.G., McCarty, E.C., Parker, R.C., Spindler, K.P., Wolcott, M., Wolf, B.R., Williams, G.N. (2008b). A systematic review of anterior cruciate ligament reconstruction rehabilitation: part II: open versus closed kinetic chain exercises, neuromuscular electrical stimulation, accelerated rehabilitation, and miscellaneous topics. The Journal of Knee Surgery, 21(3): 225-234. Wright, R.W. (2009). Knee injury outcomes measures. Journal of the American Academy of Orthopaedic Surgeons, 17(1): 31-39. Yoo, J.H., Lim, B.O., Ha, M., Lee, S.W., Oh, S.J., Lee, Y.S., & Kim, J.G. (2010). A meta-analysis of the effect of neuromuscular training on the prevention of the anterior cruciate ligament injury in female athletes. Knee Surgery, Sports Traumatology, Arthroscopy, 18(6): 824-830. Young, R., Aronsson, D., Johnson, R., Ettlinger, C., Shealy, J., (1976). The etiology of ski injuries: An eight year study of the skier and his equipment. The Orthopaedic clinics of North America, 7(1): 13-29. Zätterström, R., Fridén, T., Lindstrand, A., Moritz, U. (2000). Rehabilitation following acute anterior cruciate ligament injuries–a 12-month follow-up of a randomized clinical trial. Scandinavian Journal of Medicine and Science in Sports, 10(3): 156-163. National Guideline Clearinghouse (NGC) (https://www.guideline.gov/). Accessed 16/2/2014. Centre of Evidence based medicine Oxford United Kingdom (http://www.cebm.net) Accessed 16/2/2014. The contents of this article – Management of ACL Ruptures in Skiers, is aimed at medical professionals. It is provided here for informational purposes only and should not be treated as medical or health management advice. The materials herein are not intended to be a substitute for professional medical advice, diagnosis, or treatment. Always seek the advice of your doctor, physiotherapist or other health care provider with any questions you may have regarding a medical condition. Never disregard professional medical advice or delay in seeking it because of something you have read in this article or website. Reliance on any information provided herein is solely at your own risk. The content of this article – Management of ACL Ruptures in Skiers, is copyright © 2016 of Suegnet Meyer and Meyer & Associates. Transmission or reproduction of the contents, beyond that allowed by fair use as defined in the copyright laws requires the written permission of the copyright owners.